Compact wide-angle prime is designed for full-frame Sony E-mount mirrorless cameras, however can also be used with APS-C models where it provides a 52.5mm equivalent focal length. Maximum f/2.8 aperture helps to achieve the slim, portable form factor while also remaining versatile for use in a variety of lighting conditions. Two aspherical elements and one high refractive index element help control spherical aberrations and distortions for improved sharpness, resolution, and clarity. Seven-blade diaphragm contributes to a smooth and pleasing bokeh quality. Aluminum alloy housing is both lightweight and durable. Box Dimensions (LxWxH) 5.0 x 4.8 x 4.8"
AF 35mm f/2.8 FE Lens for Sony E is rated 4.3 out of 5 by 29. Rated 2 out of 5 by Luciano from The lens is sharp, but the quality control is questionable. I got this lens to use with a Sony a7Riii. I received the lens and the camera together and I was very excited to exploit the full potential of this combo. However, as soon that I got it, I noticed a strange spot in the front element. Looking close, I realized that the spot is inside the lens. At first, I thought is was some sort of speck. But I took a macro photo of it and it seems that the coating of a inside element of the lens is pealing off. Check it by yoursef in the photo below. I took a couple of pictures with it and the images are sharp indeed, mainly when stoped down to F/4. But I will return this copy and ask for another one. Samyang quality control should have avoided this lens to be in the market. Rated 5 out of 5 by Eric from Excellent for the price. This lens is as light as air. It is extremely sharp wide open and gets razor sharp stopped down to f4. Bokeh and color are nice too. When you need a tiny, air weight lens as your only companion for the day, this lens more than satisfies. Fast autofocus with not much sound.? This lens is 1/3 the price of the Sony 35/2.8. It's a fantastic little bargain and I can think of a ton of ways it will come in handy for people, landscape, and vacation images. Rated 5 out of 5 by Gabriel from I like this lens, but for the price I LOVE IT! First of all this is obviously a budget lens that has in its favor a small form factor. ?AND... it has AF. ?I keep this lens on my camera (A7III) when traveling or when I don't need the 1.8s ?for professional work. People complained about noisy AF... in my experience the AF is silent when using AFC in video and only makes noise when you half press the shutter to force a refocus or in photo mode. ?Thats my experience. ? I have the 28mm f2, the 55 f1.8, and 85 f1.8 batis ?and this lens is great because its small, light, and has good image quality. ?I would give it a 4 in general but then you look at the price point and its a 5. ?Also I think when you keep the lens hood on that it is a handsome little lens. Rated 4 out of 5 by Eric from Awesome lense. Just got it today, and after playing with it for a bit, I can say that the AF motor is not as loud as I thought. For the price it takes nice sharp pictures great bokeh, and very small, only negative is the motor noise. But bought it knowing that, so it's not a bother. I did give it 4 stars only because I had to exchange it due to the one I got having issues with the lock-on AF-C, it would lock on but any movement, and sometime when not even moving, it would go crazy and start searching for focus and will not find it unless the camera is still. I requested an exchange and hope to get one that works as the ones reviewed online. Rated 5 out of 5 by Robert from Samyang 35mm f/2.8 on a Sony a7m3 You already read reviews on how sharp this lens is. What many reviewers don’t discuss is how the lens performs at night. Here are some observations: For objects that are illuminated by nearby lights, such as streetlights or flood lights, the images are sharp. Please see the outdoor Christmas decorations in the attached photo. For sources of light, such as neon lights or Christmas lights, the lens does NOT blow out the light source beyond recognition. Overall, this is a very good lens for night photography. Pluses: - Instead of a lens bag, the lens comes with a round zippered pouch. A nice touch! - lightweight lens, pairs well with a7 cameras, good walk-around lens - sharp, excellent contrast and color Minus: Worst lens hood ever! Rated 5 out of 5 by Jilanne from Fantastic little lens! This really is a great lens for a low price. I needed a fast and portable prime and was so excited to find a 35mm at a good price point for my Sony a7. Dont let the size of this little lens fool you – the AF is fast, it performs fantastically in low light, and travels light. Ill be using it for many adventures to come! Rated 5 out of 5 by Matt from For the price it cant be beat. Got this baby for $280 its feather light. looks good on the camera is a tiny combo. Very fast and accurate focus. Eye auto focus works great this is my second lens i got for my a7iii i also got the samyang 50 1.4 and its a stellar lens for the price as well. I would definitely buy another samyang lens. How severe is it not to have weather resistance? Shoot during the dusk or foggy day effect the lens at all? Samyang AF 35mm f/2.8 FE Lens for Sony E,B&amp;H # SASYIO35AFE. Weather resistance typically refers to precipitation/moisture, such as rain or snow, or sealing from dust. 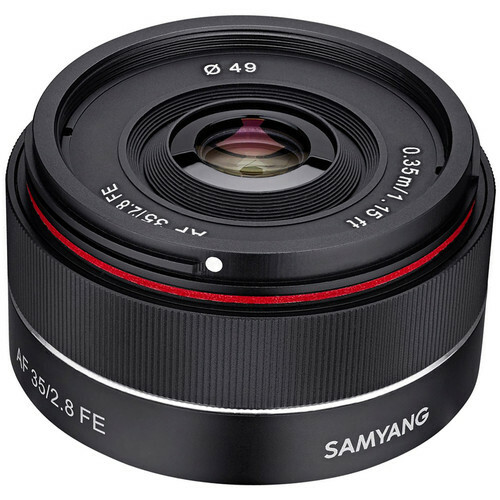 As the Samyang AF 35mm f/2.8 FE Lens for Sony E is not weather-sealed, while you may use the lens in a light drizzle or light snow, I would not recommend using it in a sustained or moderate/heavy rain/downpour/snow. Using it in a dusty/windy environment would also not be recommended, such as at a rodeo or at the beach on a windy day. IS it new? or used? Why is it cheaper than used one? A regular B&amp;W UV filter-- 49 'm, does not fit. It's there a filter with the threads on the outside ? Or will it even take a filter? The lens has an outer ring that can be removed and then a 49mm filter will fit. No matter what Staff says, 49mm does not work on this lens and b&amp;h should remove it from the accessories suggestion below this item. The literature says 40.5mm. B&amp;h should send me a replacement. Can you register a Samyang lens for warranty repair in the USA? Or do you need to buy Rokinon to get the USA warranty? This is a good question. However, like you, I am only a customer and have nothing to do with the Samyang organization. It's odd, and perhaps irresponsible, of B&amp;H to forward your question to me. It's their job to find out this information, both for your benefit, and for B&amp;H's so they can answer future inquiries. I wish you good luck with the lens - images are razor sharp. Does this lens require a dock that sells separately for downloading updates? Is this the same lens as Rokinon AF 35mm F2.8 FE? It should be. It looks identical, with the only difference being the logo. Rokinon is a Samyang brand. can i use for sony a6500? From the instruction manual, this lens is designed exclusively for all Sony E-mount cameras including the Sony a6500 APS-C body on which it will have a 42.9 degree angle of view.